It's no secret that online user reviews can be of great significance to businesses. But a recent search of some brick-and-mortar businesses reveals just how important these reviews can be - particularly in the eyes of Google. And anything important to Google is important to the online success of your company. I recently experienced some car trouble. So, I had the car towed to a local dealership to get estimates. This morning I needed to call and get an update so, naturally, I turned to Google and typed in the name of the dealership to get the phone number - I knew that because Google knows my location, I would have the phone number displayed quickly. Below are the top three results on the search engine results page (SERP). This page - still a Google page - features four more negative reviews. And now I'm considering a new place to take my car. Another point of interest is the source of these reviews. 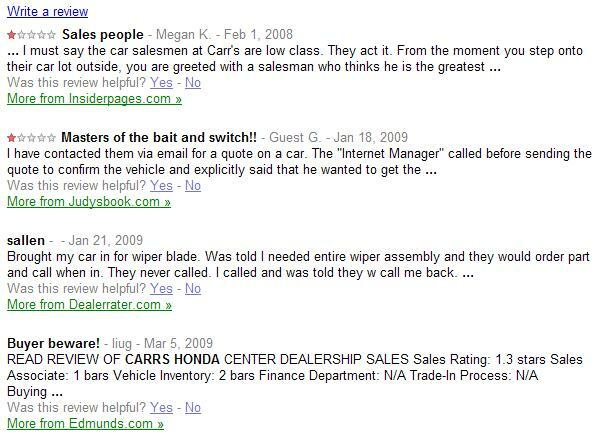 InsiderPages, JudysBook, DealerRater and Edmunds. Most are relevant to the auto industry, thereby carrying weight with consumers. In both cases, notice the limited text included in the reviews. This is very important, as most users will forgo a click-through if they learn what they need to know right away. If you're soliciting reviews, writing reviews or attempting to respond to a review, make sure to get right to the point. There's no need - and no room - for a flowery introduction. These are the first three results after a section with a Google Map, list of locations and phone numbers. Here, we find reviews in the first two spots, and a link to more reviews in the third. It's interesting to see that Yelp is listed (expected) but right below that is a link from Flickr. Click through and you get a photograph, along with the user's comments, and below that, comments from other Flickr users. Thought prominent user reviews were limited to Yelp? Think again. This is a clear indication that your business' reputation is on the line, online, everywhere. That's a good enough reason to conduct searches for reputation management purposes regularly, and across all portals where users are actively communicating. That means Flickr, Facebook, YouTube, MySpace, Twitter and many other places. Also, be aware of your industry and its authority sources - such as the case with Carr's Honda and Edmunds and DealerRater.